Ch’i is the basis of Traditional Chinese Medicine (TCM), and acupuncture is one of TCM’s tools for stimulating ch’i. Whereas some research has been conducted on ch’i, scientists have not yet satisfactorily identified, measured, or explained it. Therefore, it is misleading to try to describe ch’i using words like energy or force. Such words are often used but have precise scientific meanings that may not apply. However, ch’i may have a biological basis. When we look at dead cells under a microscope, they are motionless. Much of what we know about cellular changes is from seeing dead cells “frozen” at different stages of development. However, there is a dynamic attribute of living cells similar to that seen in living, single-celled organisms such as amoebas. Living plant and animal cells actually undergo internal movement within the cytoplasm. This activity is termed protoplasmic streaming.2 Streaming is thought to redistribute nutrients within cells and may help cells to absorb oxygen and nutrients and expel metabolic wastes. In tissues comprising many cells, there may be a corresponding activity involving masses of cells in unison—a sort of wave-like undulation. Such organized motion could transmit vital information from organs and glands to other organs and glands to regulate their activities and secretions. This hypothesis is consistent with the concept that ch’i, blood, and breath are related and that ch’i harmonizes essential bodily functions. It is also consistent with the fact that ch’i is often experienced as a tingling sensation, and its flow is experienced as a wave. It is known that all muscular action results from the electrical stimulation of muscle fibers by nerve impulses from the brain and spinal cord. A human body has on the order of a hundred billion nerve cells and an astronomical number of neural connections and interconnections.3 Even when we have no intention to do a physical action, nerve impulses to muscles continually occur but well below the level that would cause external muscular action. This constant background stimulation keeps muscles in tone, and were it absent, muscles would sag and not be ready to respond when required. For example, people who suffer from Bell’s Palsy, which is a disorder of the facial nerve that controls the facial muscles, can experience drooping of the lower eyelid and the corner of the mouth on the affected side. Alternatively, background stimulation that is too strong can cause tremors and tics. Next, consider that it is known that when you simply watch someone do an action or even imagine that you are doing it, your brain sends nerve impulses to stimulate the fibers of exactly the muscles that would cause that action, with no external muscular action occurring. Athletes utilize this fact to practice movement mentally,4 without any exertion, even when physically exhausted. In practicing T’ai Chi Ch’uan the whole body relaxes. Fig. 1. 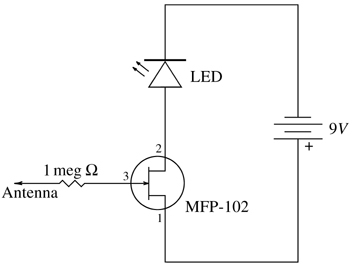 The circuit for a very sensitive electroscope, which can indicate the presence of minute electrostatic fields. Fig. 2. Photo of the above electroscope. Fig. 3. 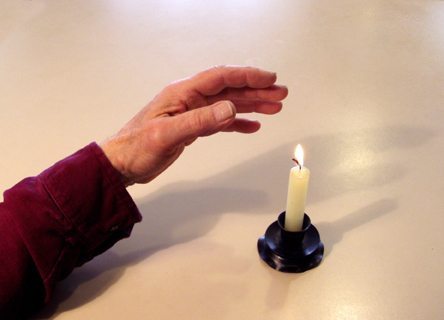 An unsuccessful attempt to affect a candle flame with ch’i. The most basic element of experiencing and responding to sakki can be practiced by several people as follows: All but one person (the “attacker”) stand in a circle about fifteen to twenty feet wide, with their backs to the center. The attacker holds a model knife or sword and stands in the center. He then quietly and slowly approaches one person from behind and imagines attacking with his knife. In order for the imagined attack to be realistic, the attacker must have the intention to do harm even though no harm will ensue. When the person being threatened feels the urgency to move away from the attack, he/she turns around. If the victim does not feel the attack after a reasonable amount of time, the attacker “cuts” the victim. That way the victim can then review what he/she experienced during the stages of being threatened and learn to recognize those feelings when they occur again. Often, beginners who do the above exercise fail to consciously recognize the feeling of being in danger, but their bodies “know” and react by moving visibly. It does not take long, however, for even beginners to recognize the urgent feeling of sakki. The other day, I noticed a starling on my neighbor’s lawn, intently pecking for food. I focused on the bird, and it immediately stopped and looked up. Without moving, I relaxed my focus and went into my own thoughts. The bird then went back to its pecking. Again, I focused on the bird. It again looked up and then pointed one eye in my direction. Again, I relaxed my focus, and the bird then went back to its pecking. There is no question in my mind that the bird sensed my focus on it even though I had no intention of harming it. Of course, wild animals have a much greater ability than that of humans to perceive danger or respond to a connection initiated by another being. If they did not, they would not stay alive very long. Nevertheless, in my experience, humans, too, possess this ability and can vastly increase it. My experience over the years confirms that just as we can sense anger and its associated danger, we can sense intention in other areas. Thus, it may be that when one person has the intention to send healing ch’i to another, that intention may have an effect on the nervous system of the recipient, thus intensifying the recipient’s ch’i flow. So far, science has not explained how a person can sense the intention of another in the absence of evident cues. The underlying phenomenon may involve the interaction of physical quantities10 that are known but which scientists have been unable to measure.11 Or, it may involve physical quantities that are not yet known. Perhaps the mode of transmission is not even physical, in which case, science in its present form may not have the tools with which to uncover the process involved. 1Robert Chuckrow, T’ai Chi Ch’uan: Embracing the Pearl, Rising Mist Publications, Briarcliff Manor, NY, 1995, pp. 17–19, republished as The Tai Chi Book, YMAA Publication Center, Boston, MA, 1998, pp. 20–22. 2See http://www.youtube.com/watch?v=0y8wjri0HgM/ and http://www.youtube.com/watch?v=n70rlWvFovo&NR=1/ for short videos of protoplasmic streaming. 5The Essence of T’ai Chi Ch’uan: The Literary Tradition, Translated and Edited by Benjamin Pang Jeng Lo, Martin Inn, Robert Amacker, and Susan Foe, North Atlantic Books, Berkeley, CA, 1985, p. 49. 6The Essence of T’ai Chi Ch’uan: The Literary Tradition, p. 87. 7The circuit and instructions for building and using this device are available on http://www.amasci.com/emotor/chargdet.html/. 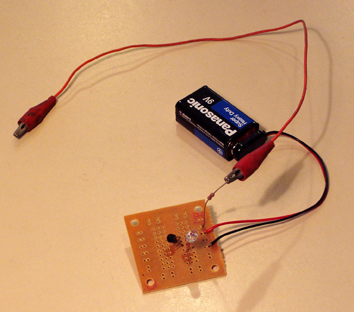 All parts for building this circuit are available from Radio Shack. 8Stephen K. Hayes, The Ninja and Their Secret Fighting Art, Charles E. Tuttle Company, Boston, Rutland, VT, 1981, pp. 144–148. 9The Essence of T’ai Chi Ch’uan: The Literary Tradition, p. 57. 10“A physical quantity is property of a phenomenon, body, or substance, that can be quantified by measurement.” (See http://en.wikipedia.org/wiki/Physical_quantity/.) Some examples are length, mass, time, and speed. 11The following is an example of a phenomenon that involves the interaction of known physical quantities but which scientists are unable to measure: Theoretically, when a loaded elevator descends, the earth moves a corresponding amount in the opposite direction. Because the ratio of the mass of the earth to that of the elevator is so great, the movement of the earth is far too small to be measured.